Thank you, Vegan Month of Food, for giving me the opportunity to put another recipe with poppy seeds on my blog! Poppy seeds are blue and that is today’s Vegan MoFo promt. And I cannot tell you how much I love poppy seeds. I love them so much that I’ll scoff at those lemon poppy seed muffins you probably like, because they don’t contain more than homeopathic doses of my favourite seeds. I am going for 100 % poppy seeds instead! This recipe is from a Danish baking book I bought while visiting Copenhagen (maybe two years ago?). The book was bigger and heavier than a luxury edition of the bible. That and the pretty pictures lured me into buying it. Bagebog by Claus Meyer has a lot of interesting recipes, and while some of them might be considered as Danish or at least Scandinavian, most seem to be international. So I am not sure about the authenticity of this birkeskage. Something similar might be served to you in many Eastern European countries, and even in German bakeries you can find Mohnkuchen varieties. I am still calling it Danish because it’s from a Danish book written in Danish! Smart, hm? The original recipe called for 4 eggs but those were easily replaced by both soy yoghurt and aquafaba. I made some more alterations, so that new recipe doesn’t have very much to do with the original version anymore. I have never tasted the original, obviously. But my version is a wonderfully moist and aromatic poppy seed cake with a delicate shortbread crust. Preheat the oven to 180°C (350°F). Grease a rectangular pan (18 x 28 cm or 7 x 11 inch) and set aside. To make the crust, beat coconut oil and sugar until light and fluffy. Add sugar and mix until a crumbly dough forms. Make sure the fat is incorporated completely. Press the dough into the pan and place in the fridge. To make the topping, beat the coconut oil and 125 g sugar (1/2 cup plus 2 tablespoons) until fluffy. Add yoghurt, poppy seeds, and semolina and beat until smooth. Combine chickpea brine, remaining 50 g (1/4 cup) sugar, and lime juice in a second bowl. Fold the chickpea brine mixture into the poppy seed mixture until everything is smooth. Remove the pan from the fridge and pour topping over the crust. Smooth down the topping and bake for 45 minutes. This cake tastes best straight from the fridge where you can store it for several days. Adapted from a recipe in Claus Meyer's Bagebog. (Birkeskage, p. 246.) Lindhardt og Rindhof 2012 (København). By the way, I did not skip yesterday’s promt “most retro recipe”. I made something and posted it on Instagram! I chose westfaelische Quarkspeise, which is a dessert made with German (or westfalian) Pumpernickel. Pumpernickel is a popular bread in the North of Germany. Most traditional versions are flourless and very different from what you might be used to in Northern America. It’s made with sourdough starter and whole rye berries or cracked rye, salt and water. That’s it. No molasses or sugar. It’s baked at a very low temperature for a very long time (around 24 hours). That way all the sugar present in the wheat berries caramelises and gives this rye bread the dark brown colour and a slightly sweet taste. Pumpernickel has a very unique texture that is chewy and al dente and still it melts in your mouth. Using the bread for desserts is super retro to me. These days it cannot compete with chia seeds, goji berries, or quinoa. 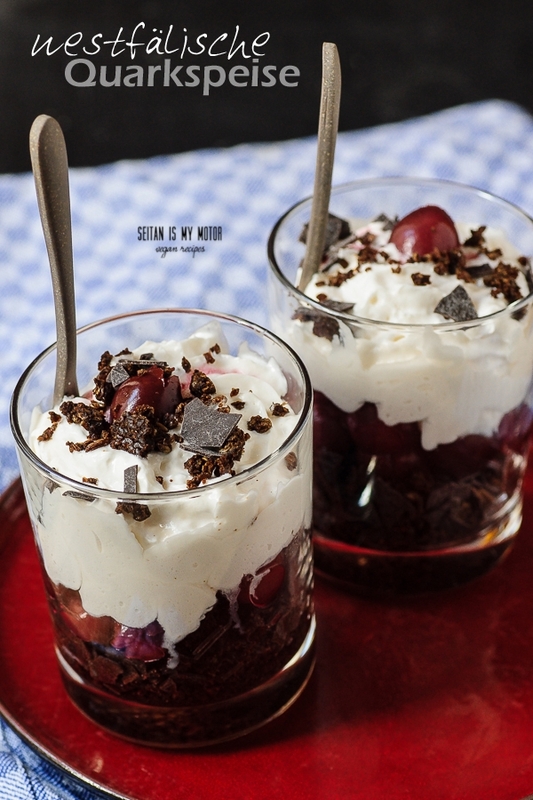 Westfälische quarkspeise is a layered dessert made with toasted pumpernickel crumbs, chocolate shavings, quark (a cream cheese like curd cheese), and canned cherries. I used an online recipe and cheated big time when it came to the quark. But my version with whipped soy cream was just as good and since I also added some Kirschwasser, it was almost like a quick Black Forest dessert, especially since the pumpernickel goes just as well with cherries as chocolate! Thank you for the recipe, this was the perfect treat to my poppyseed craving. I skipped the beating of the coconut oil with sugar both times, added a bit of salt and used kidney bean brine instead of chickpea. Everybody loved it! Hello Mihl ! 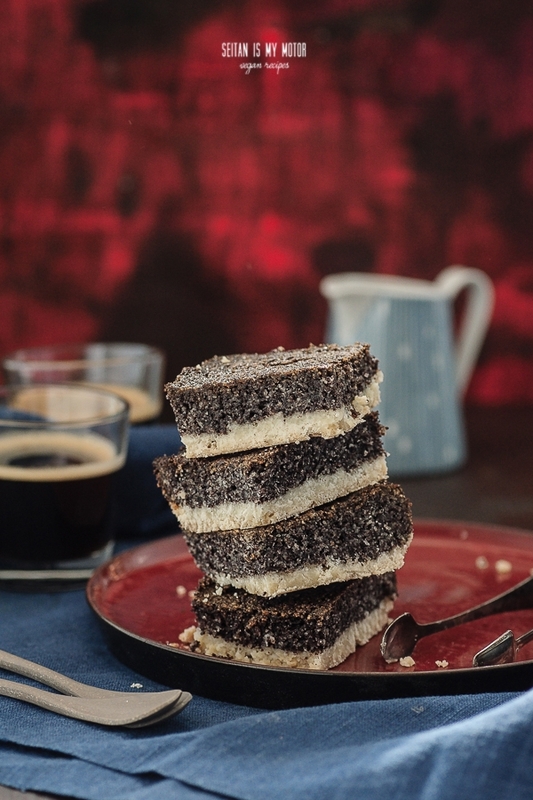 Yesterday I visited your website first time and here I got a recipe which looks so delicious ,yummy and amazing in pictures that I could not wait and made the birkeskage danish poppy seed cake for whole family in the dinner menu . I couldn’t express in words how delicious it was and whole family likes it very much. Every one said thanks to you for this beautiful recipe. 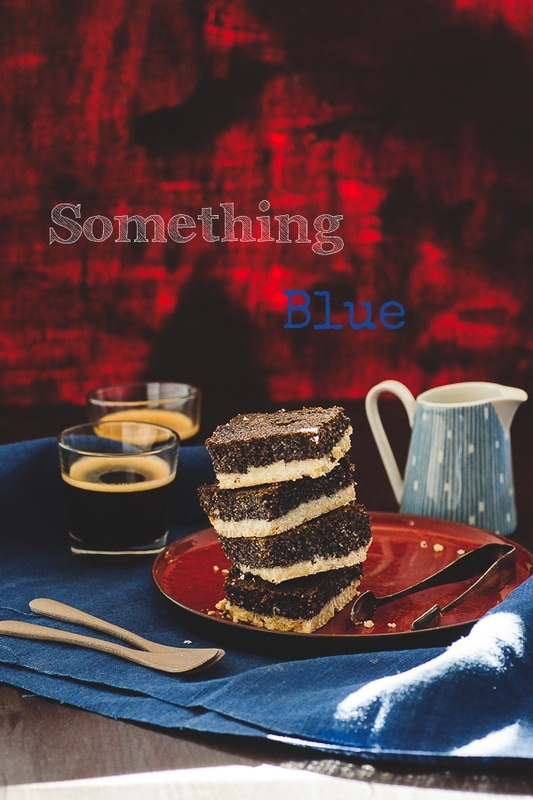 Poppy seeds are blue? I guess I have never looked at them that closely before! Your vegan MoFo game is GOALS, btw. That Westfälische quarkspeise looks so amazing. Yes, in German this kind is even called Blaumohn, blue poppy. 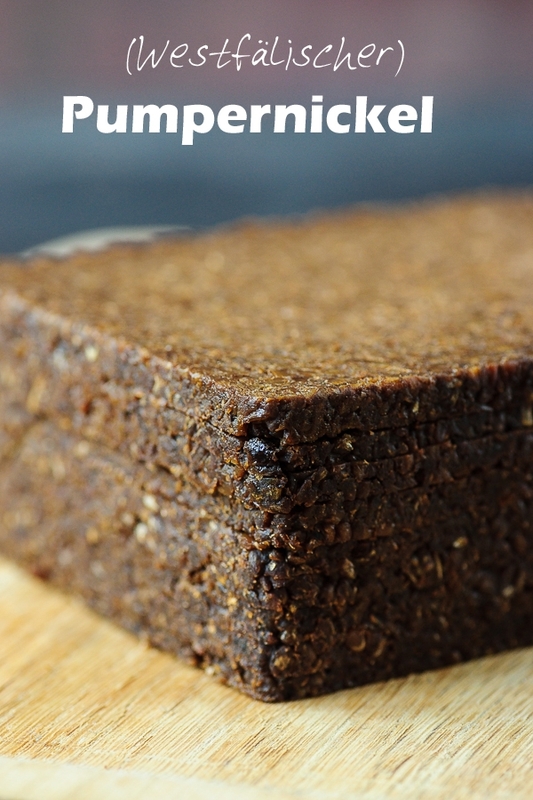 do you have your own pumpernickel recipe?! 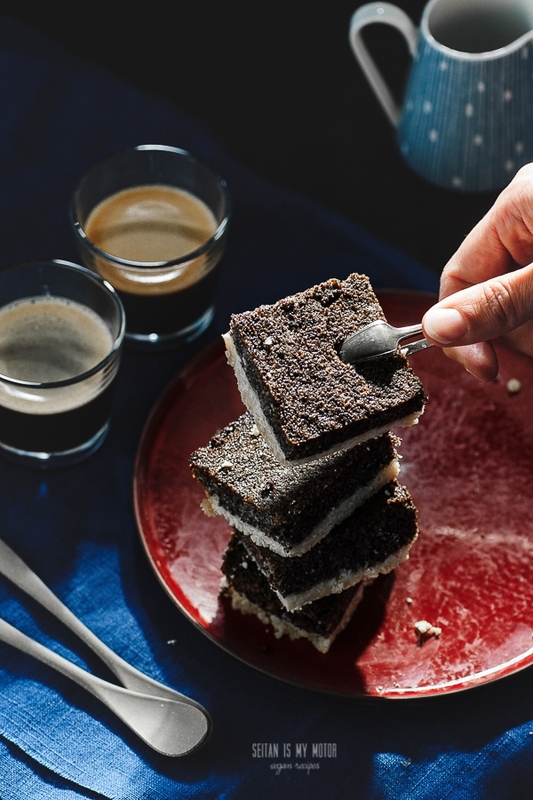 i love poppy seed cakes and this looks so good! I love your blog! Everything looks so good. All poppy all the time. I love poppy seeds! The more the better. I wrote your recipe down in my cookbook. Love the little tongs in the first picture. I never thought pumpernickel could be a dessert like black forest cake but I see it and I want to make it too! Now I wish I hadn’t eaten all that pumpernickel/rye bread I had before. I think I have everything to make this during the weekend, except I need to check what semolina is. Is it cream of wheat? I know, I know, “let me Google it for you, Celine”. Anyway, if you ever write the luxury edition of the poopy poppy seed bible, I’ll be first in line to buy it. Ha, ha, usually I have to ask these questions because I never know myself. I think it is cream of wheat. My package says “durum wheat semolina” or semoule de blé dur, if that helps. It’s like polenta and you could probably use farina, if you have that or even polenta. Oh, I’d make sure that bible would be usefull both in the poppy and poopy seed department. Wow, what beautiful photos and amazing sounding cake. This is what I love about Mofo, discovering ideas I’d never have thought of! I’ve yet to experiment with Aqua Faba, my dislike of meringues put me off but I keep seeing it now used in allsorts of other interesting ways. I love poppy seeds too but haven’t done anything other than mixing them with lemon. I love the lemon and poppyseed loaf in the Babycakes book. I really want to try this now. Yes, that’s what I like about MoFo, too! amaaaazing! I love poppy seeds and pre-vegan I used to buy this Polish poppy seed bread swirly thing that was so heavy on the poppy seed– loved it! Oh, that can be easily veganised, too!